What goes through a bride's mind when she hears the following word: Traditional? Most people think of classic whites, neutral tones or perhaps hints of metallics. As the world is progressing, more women are straying from the norm and venturing out into the abyss of color. Hot pinks, deep reds, sassy blues are all making appearances in weddings. Each bride has her own unique taste of color and personality. Adding a bit of magic to her special day. 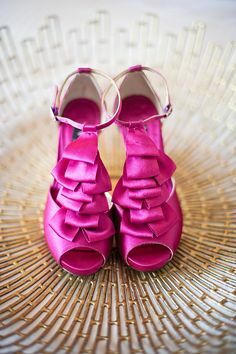 The following is a sampling of shoes and purses that can be used to add some spice to the wedding day. There is a myriad of shades in the color world and below is but a taste. Hot Pink - For the bride that inspires a sensual love. It exudes a passionate and playful flair. Deep Red - The bride who is a bit more sophisticated, controlled and gives a great deal of thought into her life. Sassy Blue - Conservative, cool, calm and collected. The bride that loves to own her life in a responsible manner. Majestic Purple - The color of mysticism and royalty. For the bride that is old-fashioned but powerful in her right. Zesty Green - Spring green is the Pantone color of the year! Ever growing, youthful, abundant and peaceful. Brides who adorn this never grow old. 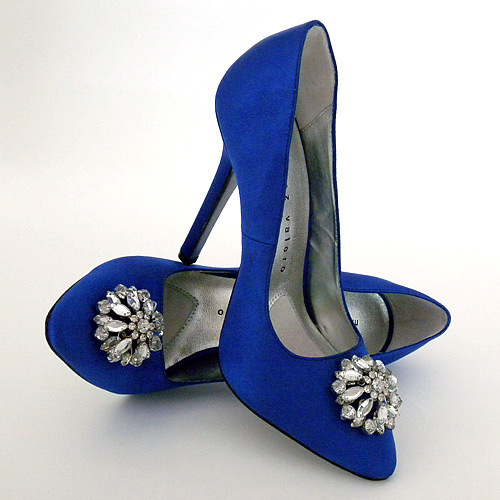 Royal Blue - A shade of blue will add a touch of electric brightness. Whether it be azure, teal, or cobalt. Classic Pink - Pink is the color of love and you can never grow wrong with this traditional choice. Bright yet comforting. Golden Yellow - Yellow being the color of the sunshine, it inspires new ideas and adds an alertness to the tone.